Do you remember the first time you saw a Disney Princess? Honestly? I can’t remember the first time but I know I’ve felt like the Disney Princesses have been a part of my life for as long as I can remember. It wasn’t until Alladin debuted and Princess Jasmine came on the scene that I realized all of the princesses before her looked nothing like me. I was mesmerized by Jasmine’s “wavy,” full hair, brown eyes and brown skin. She spoke to a part of me I didn’t know was listening. Yet, she still wasn’t me. Years later Tiana came around (even though most of her film is spent as a frog). I got excited all over again. Another Brown princess. This one from America. I might have done a happy dance. Tiana was the princess I looked forward to sharing with my daughter as the Disney Princess that represented her. Fast forward to 2016. We’ve heard murmurs before that a Latina Disney Princess would be unveiled. There was a small amount of controversy on whether Princess Sofia was the one so many of us had been waiting for. She wasn’t but Elena of Avalor was! JustaBXgirl on her first pony ride. That part of me that was awoken by Jasmine praised, jumped for joy and cried with the news that there was finally a true Latina Disney Princess. The best part of it is the JustaBXgirl is young enough that she will never remember the time that there wasn’t a Princess Elena. She will take for granted having her own Disney Princess like so many children before her. If you ask her who her favorite Disney Princess is the answer will depend on the day of the week. Most days it is Aurora with her pretty pink dress. In case you missed it, JustaBXgirl has a penchant for pink. Other days it will be Ariel because, I mean, who doesn’t love a mermaid? On her adventurous days she will answer Elena because as she says Elena is brave. If you ask JustaBXgirl who my favorite Disney Princess is she will tell you without hesitation Elena. She is too young to understand why. She is too young and too innocent to comprehend the importance of seeing yourself represented. Elena is such a representation! JustaBXgirl traded in her scepter and guitar for some cotton candy! She is not your run of the mill princess. She has faced adversity. Her parents were killed and she was trapped for over 40 years in an amulet! She never gave up though. That shows resilience. When given the opportunity to be crowned queen, Elena realized she wasn’t ready and opted to remain a ruling princess. That shows maturity and wisdom. When having to choose between work and family obligations she chose family and apologized professionally. That shows courage and family values. Throughout the series she show bravery and friendship. Elena is my favorite princess for many reasons but mostly because she represents so much of what I want to be and who I want my daughter to grow into. We received these products free to review. As always all opinions are honest and completely those of mine and justaBXgirl. When we received our Elena of Avalor package from Jakks Pacific I’m really not sure which of us was more excited. JustaBXgirl wanted to wear her gown everywhere. She wanted to carry her scepter and even bring her guitar for entertaining others EVERYWHERE we went. The guitar plays three songs from the show and the scepter plays one. Most of the times I tried to talk her into just the scepter (much easier to carry in mommy’s bag). If you haven’t already seen her singing along check out my Instagram. The thing is, when people see her walking around in her Elena look (complete with a red flower in her hair) they know exactly who she is supposed to be. Even people that aren’t yet familiar with Elena’s name have said “Oh, look. She’s that new princess.” The amount of times that people stop us when she’s in costume to say that she looks just like Elena is more than you would probably believe. That has never happened in any of her other costumes. And as you know JustaBXgirl loves playing dress up. Yes, she gets complemented on the others but she has never LOOKED like the other characters. Does Elena look like every Latina in the world? Nope, but she is a great way to represent us and I hope we get to meet more of her family that might look like the rainbow of colors that represents true Latina heritage. I look forward to many more adventures with Elena and with JustaBXgirl. P.S. 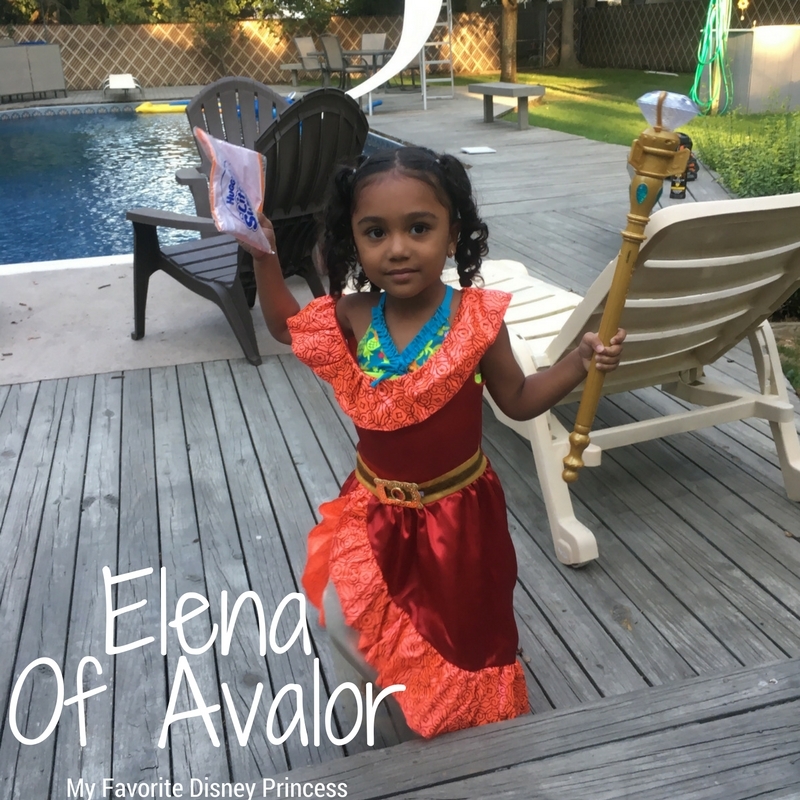 When you get your Elena lover this gorgeous costume make sure that you don’t throw it in the washer! The material of the dress is made to last but the glitter…well… JustaBXgirl is trained to put her dirty clothes in the washing machine and I didn’t think about it as I started a load. The machine washed away the amazing design of glitter on the edges and left lots of glitter on the rest of the load! Consider this my public service announcement to be wiser than me! Here’s the beautiful pattern I ruined. No, JustaBXgirl is not driving. We were at a dealership and she was showing us what she wants when she grows up! Although slow, I’m glad Disney is finally realizing that every girl deserves to see a princess that looks like her. Now, let’s only hope we’ll have a real prince that looks like ALL of our boys as well. That’s a really good point! I love the wizard on Elena. He’s a teenager that’s still coming into his own.